NANOSENSORS™ CDT-FMR probes are designed for force modulation microscopy. The force constant of this probe type spans the gap between contact and non-contact mode and is specially tailored for the force modulation mode. The FM sensor serves also as a basis for magnetic coatings (MFM). Furthermore non-contact or tapping mode operation is possible with the FM probe but with reduced operation stability. For applications that require a wear resistant and an electrically conductive tip we recommend this type. Some applications are Tunneling AFM and Scanning Capacitance Microscopy (SCM). 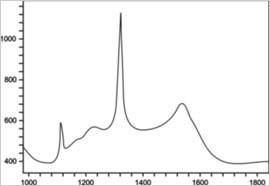 The CDT Diamond Coating is highly doped and the total resistance measured in contact to a platinium surface is < 10 kOhm. The typical macroscopic tip radius of curvature is between 100 and 200 nm. Nanoroughness in the 10 nm regime improves the resolution on flat surfaces. The reflex coating is an approximately 30 nm thick aluminum coating on the detector side of the cantilever which enhances the reflectivity of the laser beam by a factor of about 2.5. Furthermore it prevents light from interfering within the cantilever. The virtually stress-free coating is bending the cantilever less than 3.5% of the cantilever length. 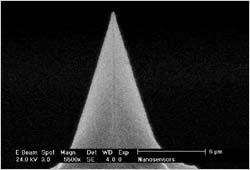 Product Screencast on the NANOSENSORS™ Diamond Coated PointProbe® Plus Silicon AFM Probes by Jörg Diebel. Please subscribe to the NANOSENSORS Youtube Channel. For further information please contact your local distributor or NANOSENSORS™ directly.